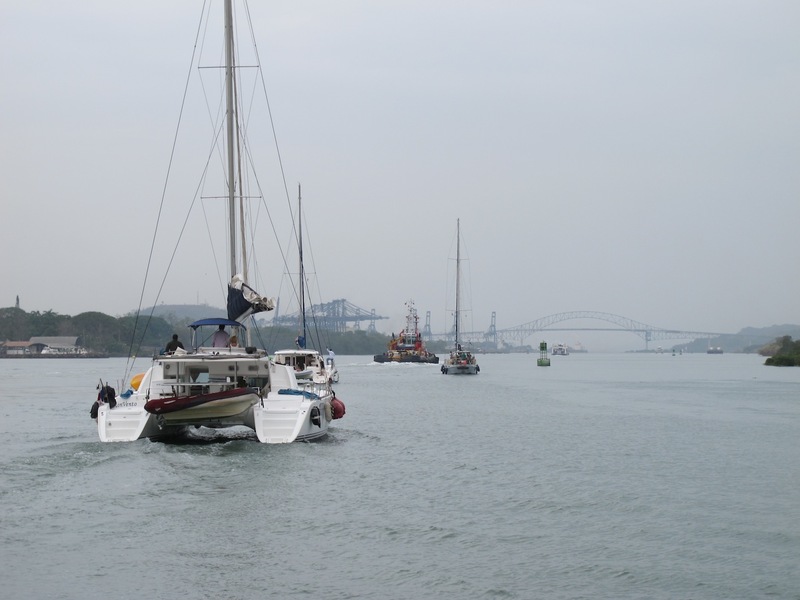 So the big day arrived and there we were, loaded to the gunnels with enough food, water and alcoholic beverages to supply a third world country, ready to experience the eighth wonder of the world, the Panama Canal. We were told to be at “The Flats” anchorage at 3pm to wait for our Canal Advisor to come aboard (every boat has to have a pilot or advisor). 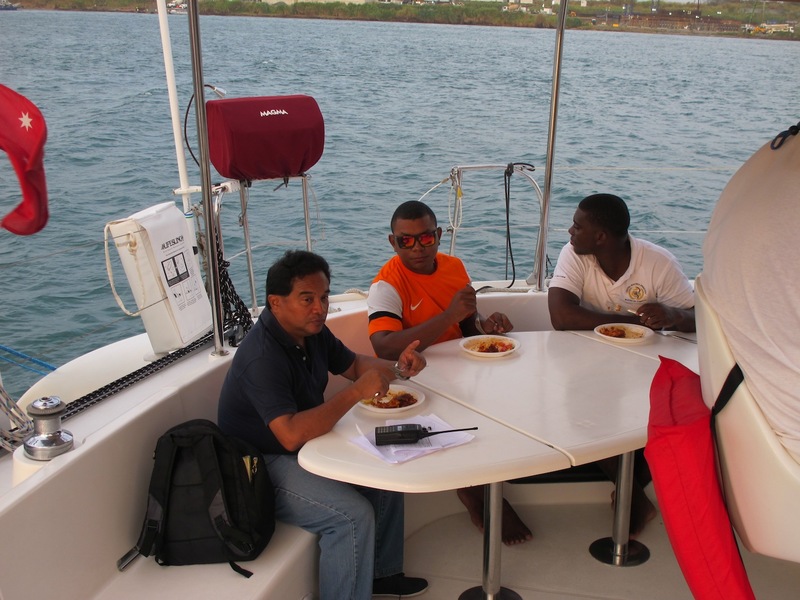 Every boat also has to have 4 line handlers plus the skipper, so we paid for two professional line handlers to join us, and our agent provided the four heavy lines and car tyres wrapped in plastic to serve as fenders. Eric and Jonathan were strapping young men who’d been working as line handlers for several years, so we knew we were in good hands – they also helped us do the last minute fuelling of our spare jerry cans, giving us a total of 600 litres of fuel that hopefully will be enough for the next 4000NM trip to the Galapagos and Marquesas. 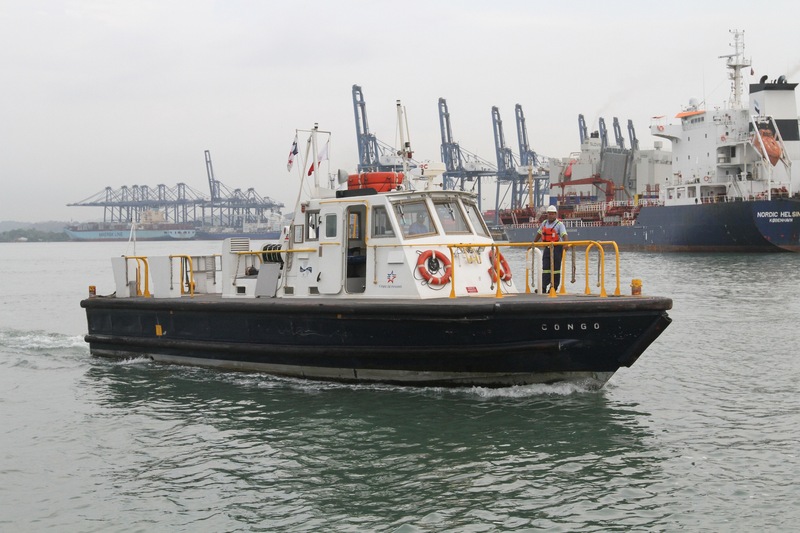 We’d heard stories from our other cruiser friends of long delays waiting for their advisor to board, but our schedule went like clockwork and Carlos, our advisor turned up on the pilot boat right on time, looking very dapper and organized with his briefcase and VHF radio in hand. 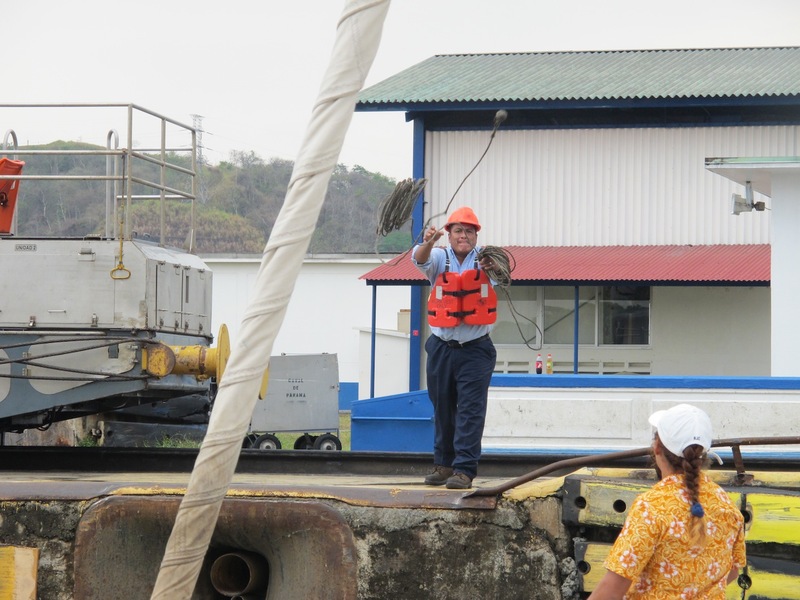 He was a very experienced tug-boat pilot, and explained how it would all work, even drawing us diagrams of the lock process. 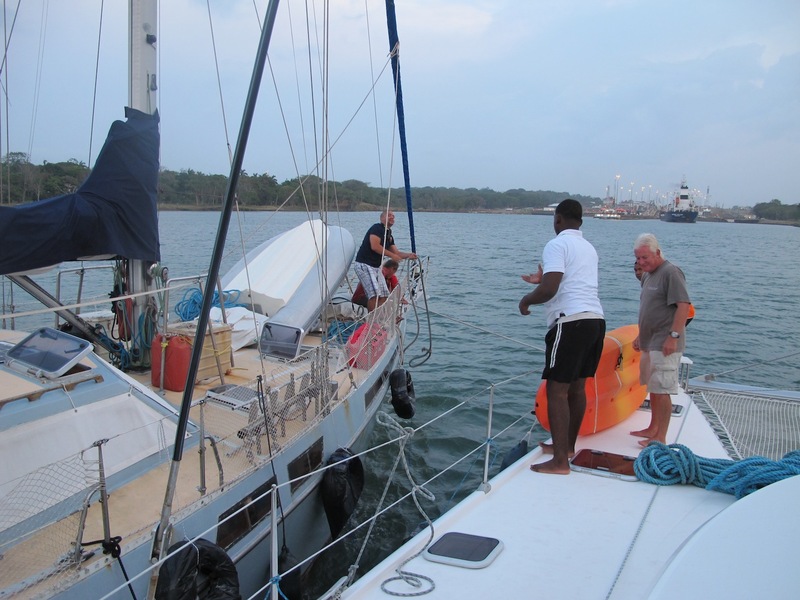 He told us we’d go through the first 3 Gatun Locks (the “up” locks) rafted up with two other yachts like a monohull sandwich – two cats on the outside and the monohull in the middle. That meant we would only need Eric and Jonathan to handle the lock lines on one side, so Geoff and I were free to roam around taking photos and video of the action. 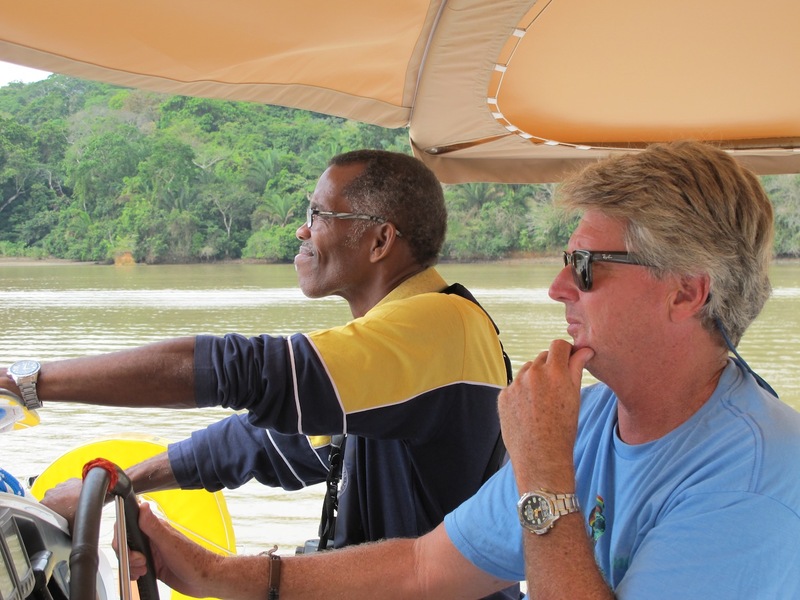 Bruce thought he was off the hook for steering too, as usually the centre boat drives the raft. 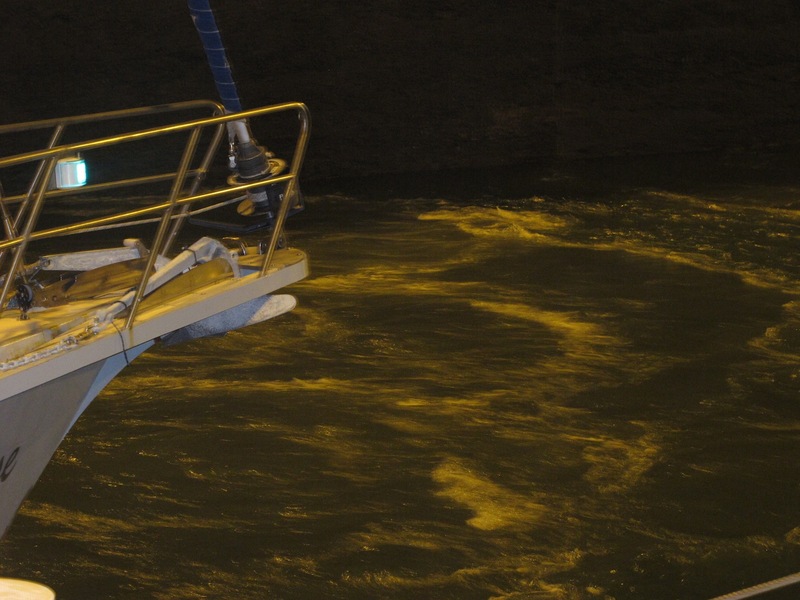 But the guy steering the monohull was so hopeless that Bruce and the other catamaran skipper ended up doing most of the driving through the locks. One of the other requirements is to provide meals for the Advisor and line handlers. Our agent told us stories of yachts who hadn’t provided ‘adequate’ food, so the advisor had ordered a meal to be delivered to the yacht at huge expense (to the yacht!). Gee, no pressure! I pre-cooked a big lasagna for the first night hoping that was going to be ‘adequate’ and served up dinner to the lads as we motored down to the lock entrance. I think they liked it, there weren’t any leftovers! 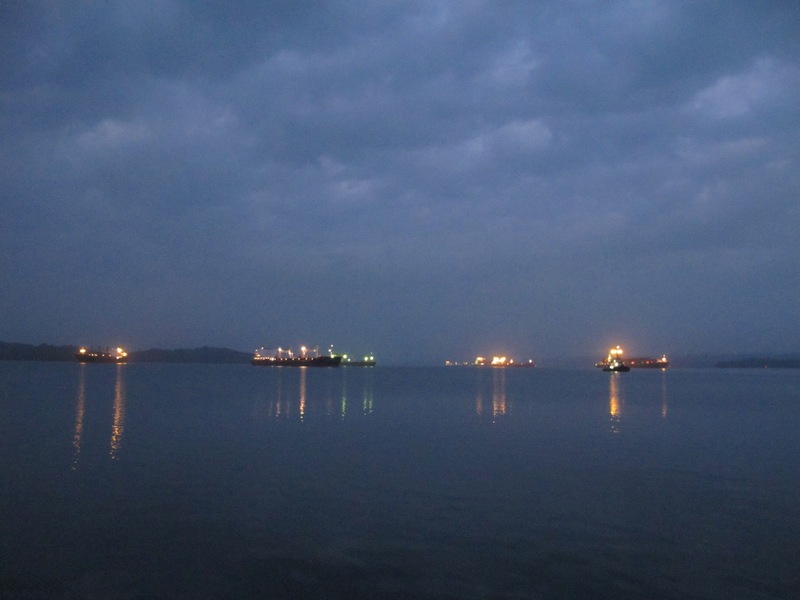 By the time we’d organized the rafting up process it was getting dark. 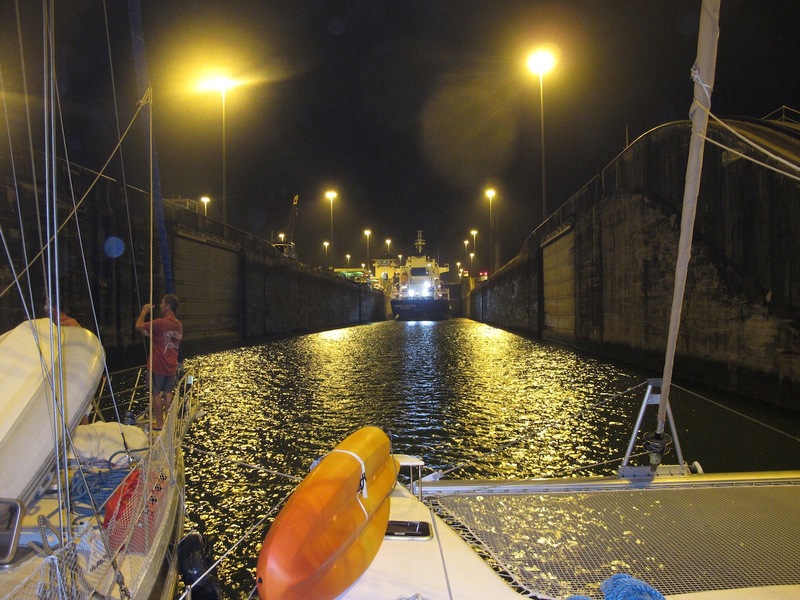 We waited for the huge big tanker to enter the first lock ahead of us, and then in we went behind him. In we go, gee we feel small! 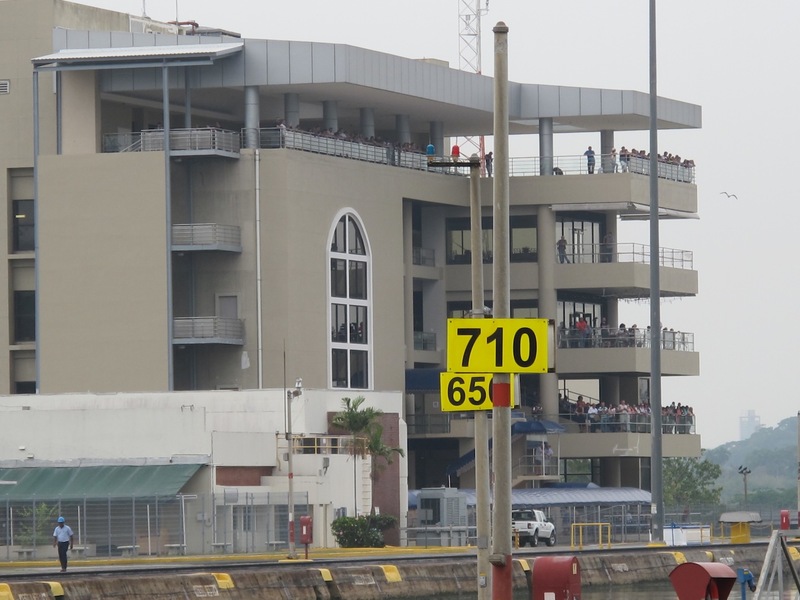 The big ships get pulled through the locks by electric trains, but us small vessels get human line handlers on the lock walls, who throw down light lines with a monkey-fist on the end. Thankfully they’re very accurate with their throwing technique! 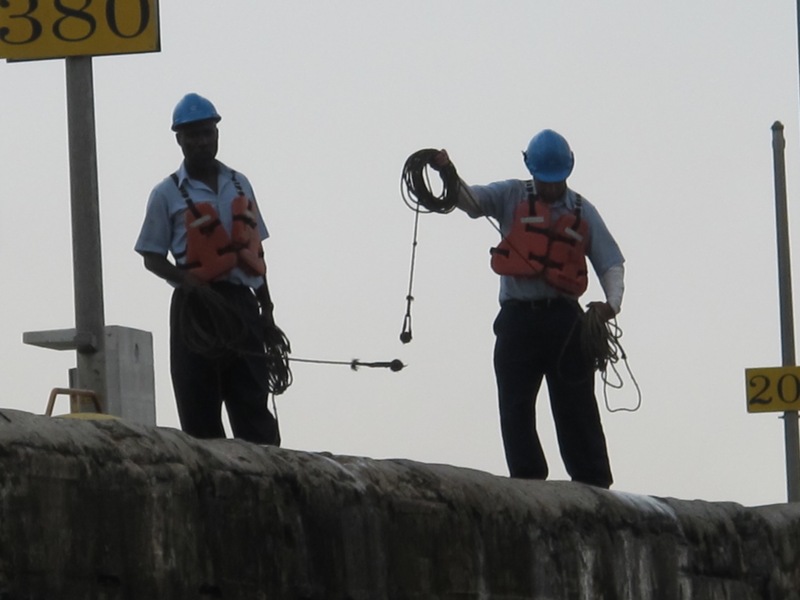 Our guys then tied these to our heavy lines, which get pulled up and looped around the bollards along the lock wall. Then the guys on board pulled the lines in until they were taut and holding us steady as the water rushed in, continually adjusting the lines as we rose higher. You can tell that Eric’s an old hand at this! What an amazing atmosphere, with the lights at night, the chatter between boats and advisors, the bells clanging as the lock gates closed and up we went. It only took about 10 minutes for the lock to fill, and then the gates up front opened, the lines were pulled back on board and we drove through to the next lock. (The line handlers on the lock wall kept the light lines attached and walked alongside us to the next lock. And then it all began again. 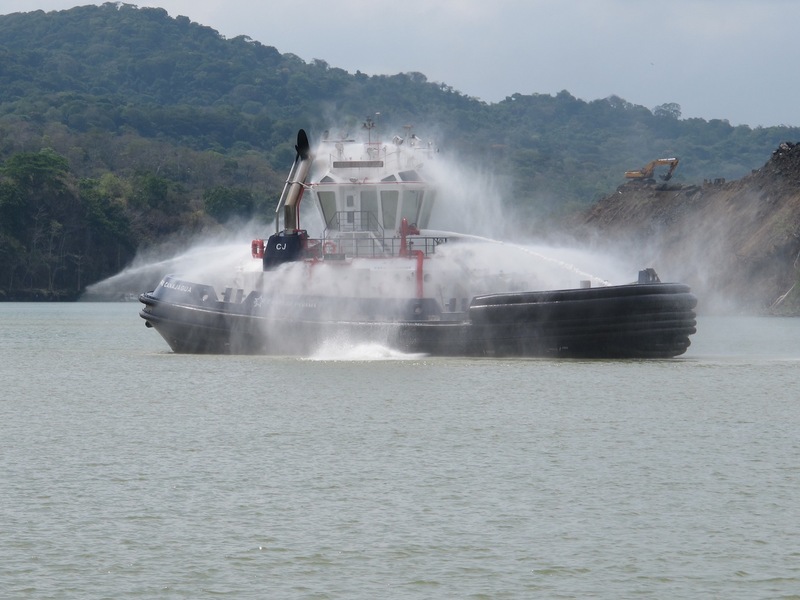 And again, until we were through the third lock and into the man-made Gatun Lake, which provides all the water for the locking process (apparently 26 million gallons each time). Once into the lake we unrafted from our buddies and motored for 15-20 minutes in the dark towards the big mooring buoys where we were going to stay for the night. 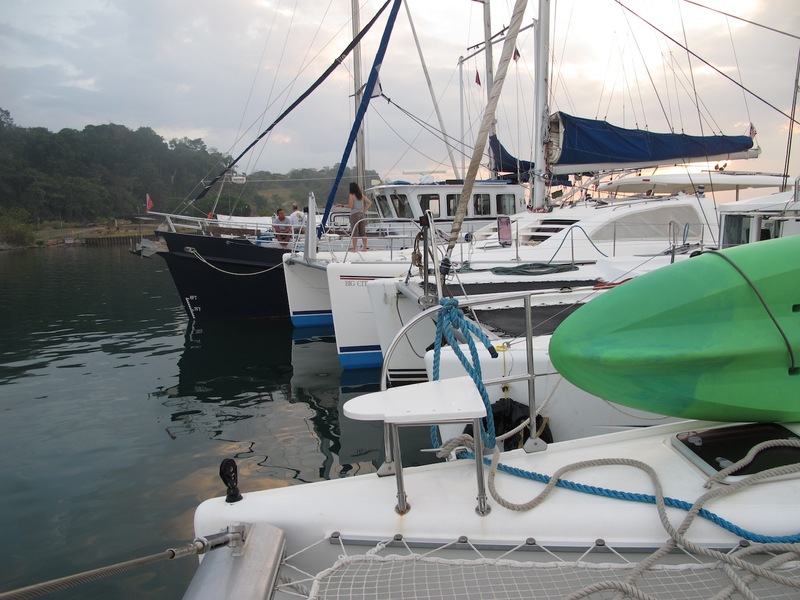 It was a busy night for small vessels as the buoys were already chock-a-block, so we ended up rafting up to three other boats hanging off the mooring. By now it was about 9pm. 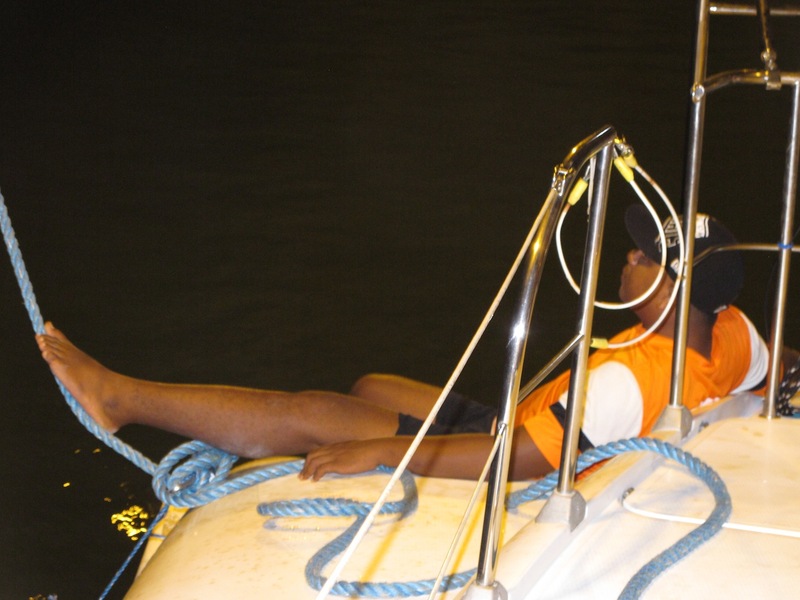 Carlos said his farewells and got picked up by the pilot launch and we settled in for the night, listening to the continuous rumble of the big ships engines as they motored past. 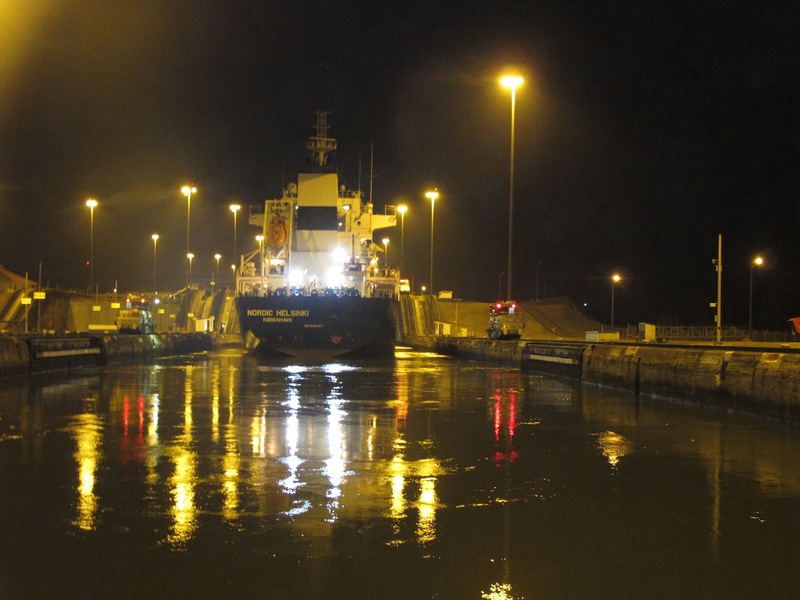 The Canal operates 24/7 seemingly without any major delays or logjams, just ship after ship after ship passing through. 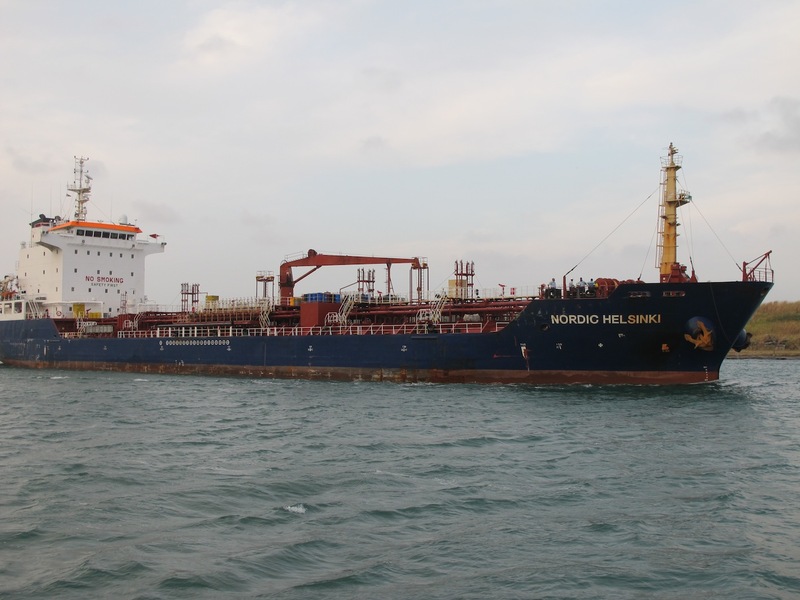 Luckily for us we’re only small fry – the big panamax ships get charged close to US$250,000 for the convenience of going through the canal. I guess it must still be worth it, but that’s one helluva lot of spondooly. We were told to be ready at 6am the next morning for the arrival of our next Advisor who’d take us through the remaining sections of the Canal. 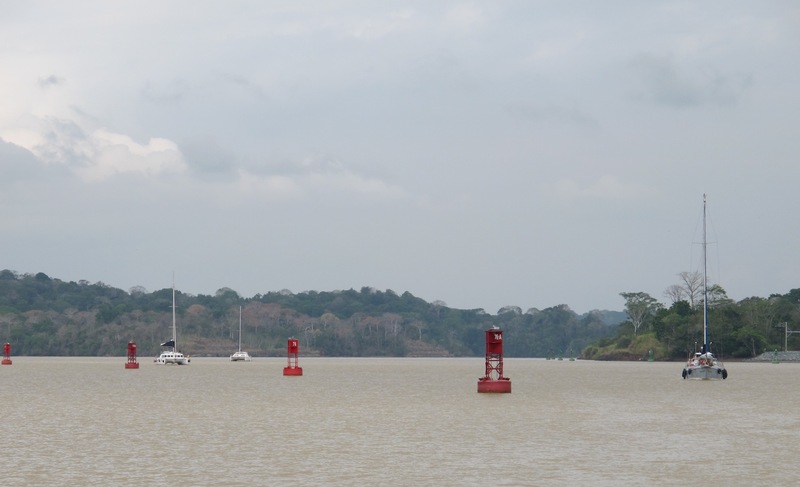 Gatun Lake is fed by the Chagres River, and the whole area is a nature reserve, bounded by lush jungle. 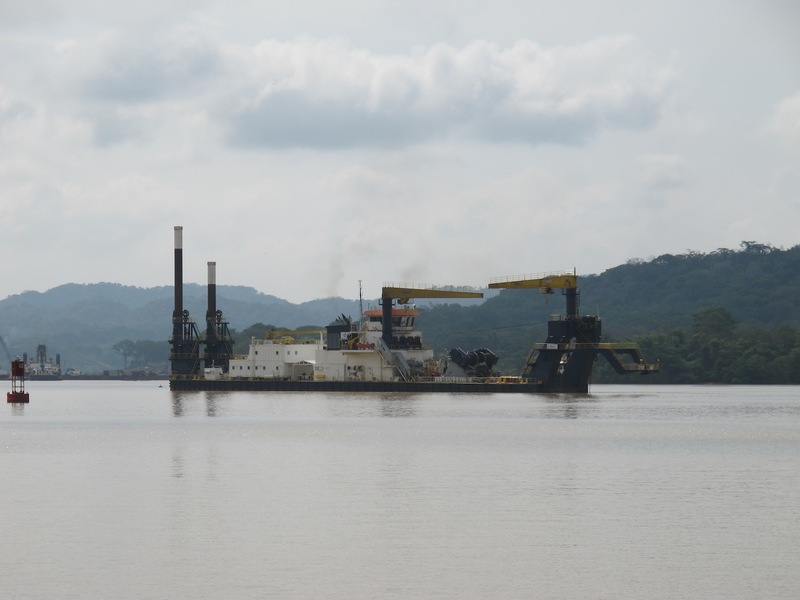 It was quite surreal to wake up to the eerie sounds of howler monkeys in the trees around us, while the big machinery continued to thunder past. Everything ran like clockwork, and our second advisor, Hector jumped on board just in time for bacon and egg sandwiches and coffee. We then spent the best part of the morning motoring through Gatun Lake and dealing with Murphy who decided to make an appearance. 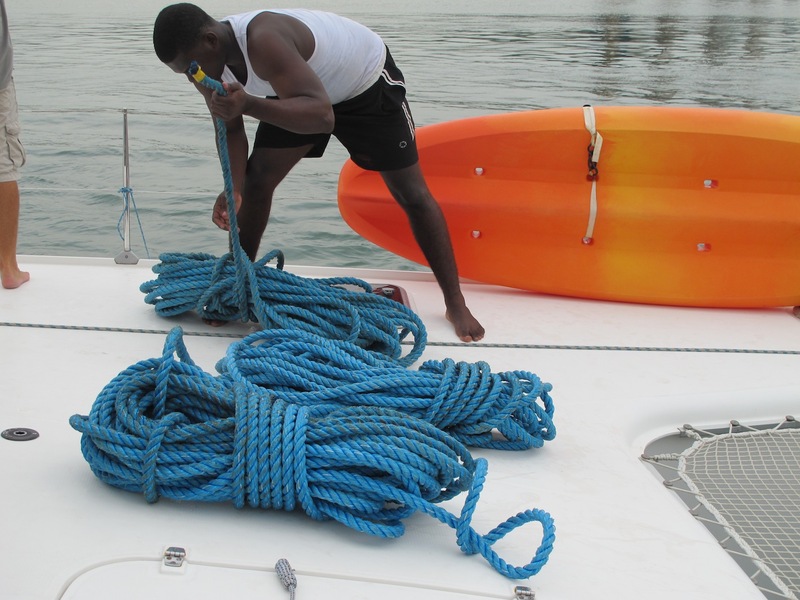 Another requirement for the transit is the ability to motor at 6 knots (and there are big penalties if you break down or delay the transit). 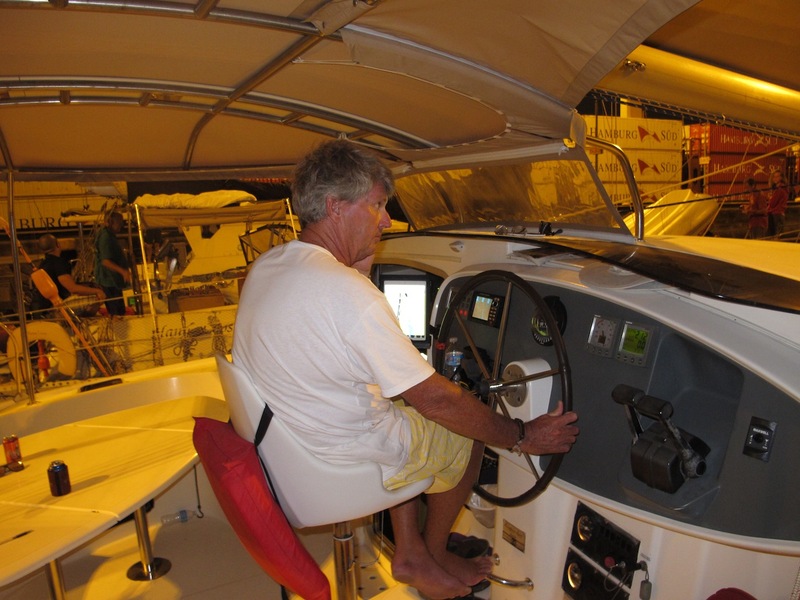 In normal circumstances we’d have no problem running both motors at reasonable revs to get 6 knots, but our starboard motor decided to play up, losing revs every so often and then surging back up. 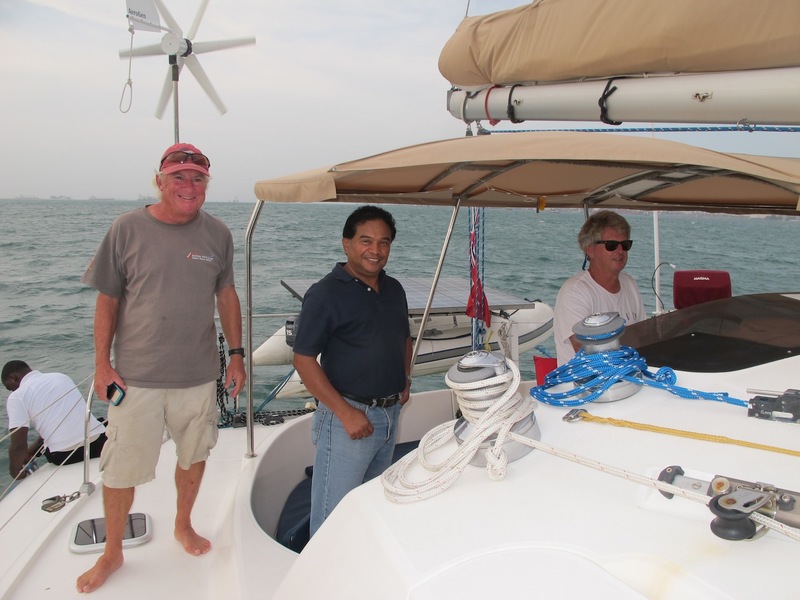 Many alarmed glances between the skipper and the Advisor, and the stress levels were palpable. Bruce managed to convince Hector that it wasn’t a big problem and we continued on, wincing every time the revs dropped. Thank God for two motors I say! Luckily for us the motor kept going and when we dropped the revs back it seemed to settle. We’re not sure what the problem is, most likely a fuel supply problem although we changed the fuel lifter pump not long ago. 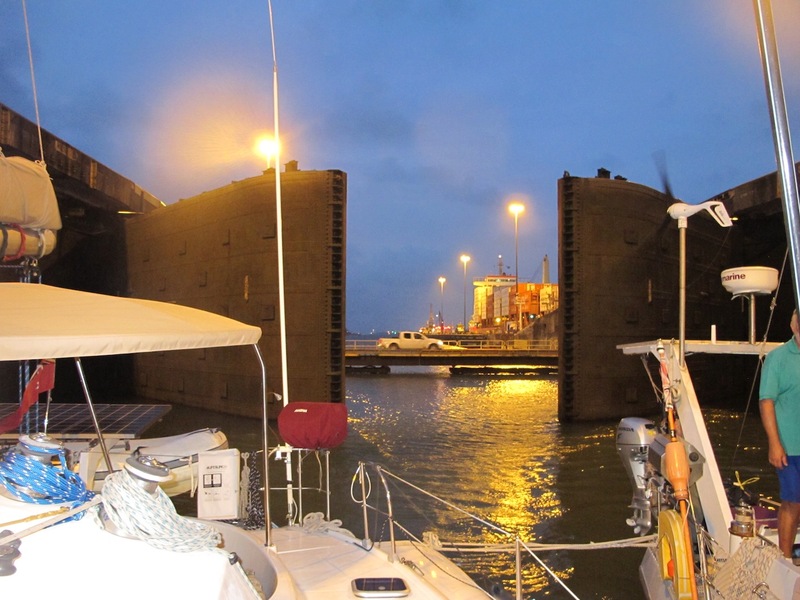 As we approached the Pedro Miguel lock, the first of the ‘down’ locks, we were told we’d be in a different configuration as a ‘special lockage’. Instead of a huge tanker in front of us, there were two large tourist boats, two other catamarans rafted together, then ourselves and the other cat, a tug and then one (different) monohull on it’s own behind us. 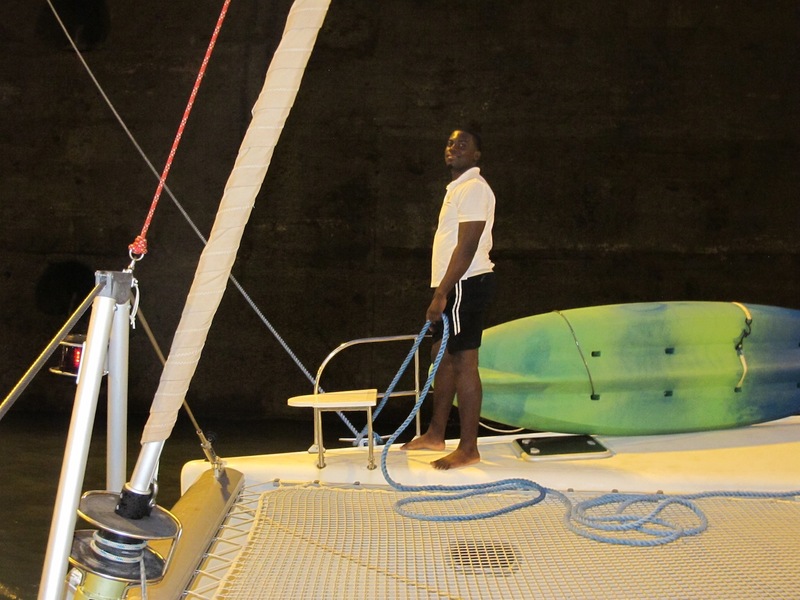 (I’m not sure what happened to the original monohull – maybe he got demoted for not being able to steer properly!). The downward locking process is a much gentler affair without all the turbulence of water rushing in, it was just a question of letting out the lines as we descended down into the depths of the lock. 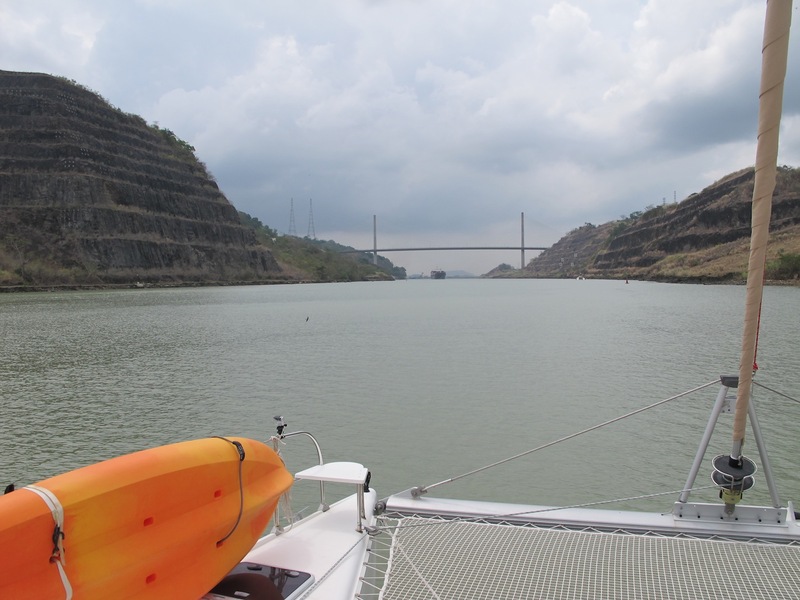 Once through Pedro Miguel there’s a short motor across Miraflores Lake which we did still rafted up to our buddy boat, and then there they were – the final two Miraflores Locks. 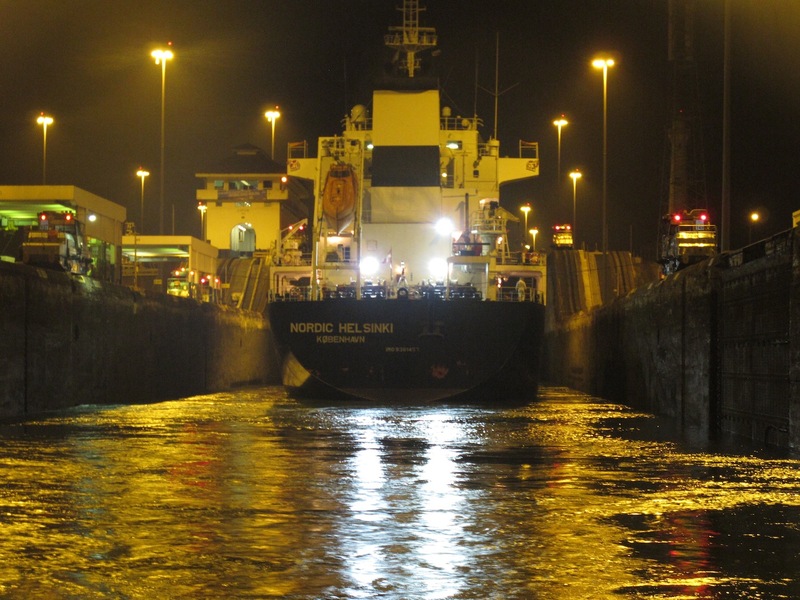 About to exit the final Miraflores Lock – Oh what a feeling! 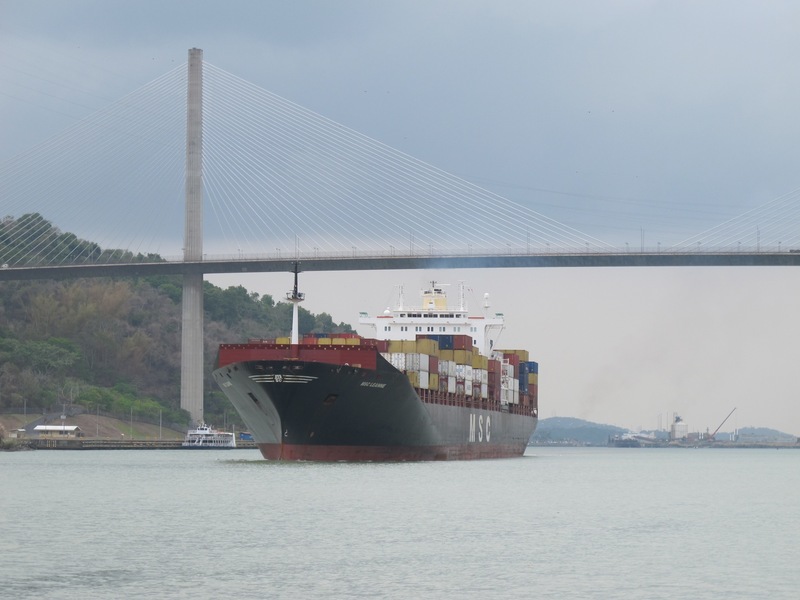 We waved to the cameras and to the tourists at the Visitor Centre and as the final gates opened to the Pacific Ocean we felt an overwhelming sense of achievement and elation at having successfully negotiated our first transit of the Panama Canal. The final gates are open – hello Pacific Ocean! Everyone un-rafted and then we motored towards the Bridge of the Americas and pulled into Balboa where the advisor and line handlers got picked up. Then it was just a short motor further on to La Playita anchorage where we’ll stay for a few more days before heading out into the wide blue yonder. We’re a bit exhausted but wow, what an amazing experience it’s been! La Playita Anchorage on the Pacific side of the canal. It feels pretty good to be here! A belated hi and a tip of the hat for what you’re doing here – the wonderful blog, let alone the voyage itself. I read that the Galapagos have put on quite a fireworks show for your arrival there. Looking forward to your next entry! Hi Paul, wonderful to hear from you and glad you’re enjoying the blog! We’d actually left the Galapagos a week before the eruption. Pity really, as it would have been quite a sight. Wow! What an amazing experience! All your friends back in Annapolis think of you often….great to hear you’ve made the Pacific, best of luck on the crossing! Hope we all get to catch up with you back on the Atlantic someday!!! Hi Rod, great to hear from you guys! We really miss Annapolis a lot, and are determined to get back and spend more time on the Eastern Seaboard and Chesapeake. We have such fond memories of our time there (apart from the drudgery of working on the boat) and you all made us so welcome. Hopefully the ice has thawed and you’re back on the water now enjoying a wonderful summer season. All the best from both of us! What a riveting story…I couldn’t read fast enough to find out what went on next…glad it all went well for you but then you always plan very well. Couldn’t believe the fees…no wonder everything’s so expensive!! !